For the first time in five years (actually, since ‘Symphony Hour’) Mickey receives considerable screen time in his own cartoon, even though he has to share it once again with his dog, Pluto. In the opening scene ‘Mickey’s Delayed Date’ we watch Mickey snoring at home, when the phone rings. It’s Minnie: she has been waiting an hour for him to come at a date with her for a dance. As soon as she has threatened him on the phone to break up if he doesn’t show up within fifteen minutes, Mickey rushes to the dance hall. Unfortunately he loses the tickets, which are brought by Pluto just in time. Much screen time of ‘Mickey’s Delayed Date’ is devoted to Pluto in a rather long scene with a humanized tall hat. Nevertheless, it’s nice to watch Mickey in fine comic shape again, although he is less flexible here than in Riley Thomson’s shorts of the early forties. This short contains a shot of an almost naked Mickey (even without gloves). 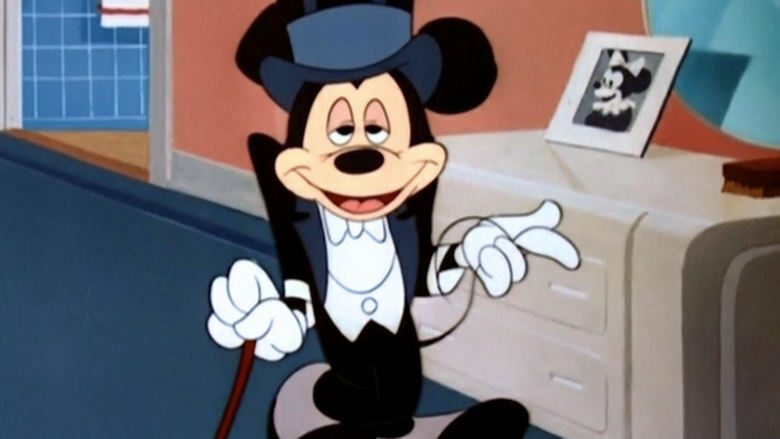 ‘Mickey’s Delayed Date’ was the first Mickey Mouse cartoon directed by Pluto-director Charles Nichols. He would direct five of the eight post-war Mickey Mouse cartoons.